The Full Delegate Conference Package includes the Welcome Drinks and all conference sessions, meals for the duration of the conference (Includes: morning tea, lunch and afternoon tea), exhibition access, attendance to the conference gala dinner and conference materials. Note: “Industry Tours 22 September” – not included. Registering for a One Day pass to the conference will include conference sessions for the chosen day/s, meals for the nominated day/s (Includes: morning tea, lunch and afternoon tea), Exhibition Access and conference materials. Please Note: This booking does not include access to conference events. 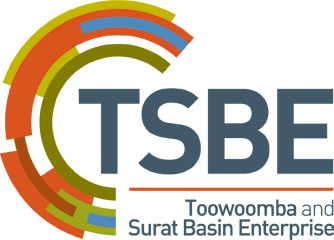 Tickets to Conference events can be purchased separately during registration. An Early Bird rate is being offered to those who register and pay prior to Friday 28 August. Following this date, all new and outstanding registration will be transferred to the standard rate. 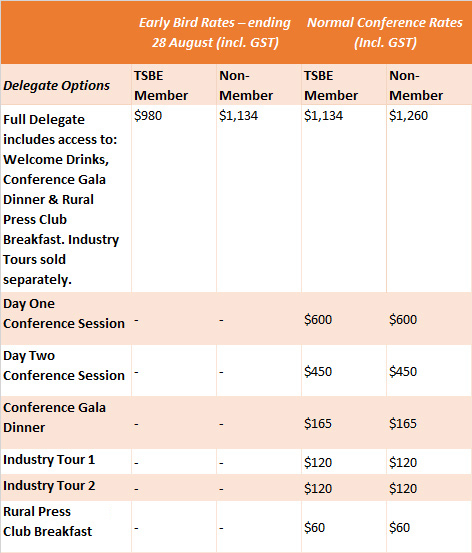 Toowoomba and Surat Basin Enterprise (TSBE) members attending the conference will receive a discounted rate for the conference. To learn more about TSBE and why being a member could link your business with opportunity please visit www.tsbe.com.au, email marketing@tsbe.com.au or call +61 7 4639 4600.